1. What is the story behind your poem? What inspired you to write it? “To Die Before You Die” was inspired by the fundamental truth that the nature of human beings is essentially good, and pure, and that everything else in our behavior that is contrary to this fact is an expression of our struggle to somehow live up to our nature, some of us fail, some more than others, but we are still good…and beautiful and magical, it is intrinsic to being human. We’re just very troubled and we suffer and we react out of anger and resentment to the extreme challenges life throws at us. This however does not define us, perhaps only on a social/superficial level but not essentially. The idea of dying before you die is a mystic notion that is against the belief that life is in its nature a tumultuous struggle and that purity, joy, clarity and light is only attained to after death. It instead points to the possibility of attaining that purity, joy, clarity and light while we are still alive, which is when it is most essential anyway. When we know that we are good, we will strive to live that goodness, to die before we die. I make a lot of reference to angel mythology, angels are regarded as most pure and good, which is very lofty and removed from humanity, it is vital to bring the idea of purity back down here, to bring the angel back to earth in ourselves. We are all angels…we’ve just let our wings drag in the mud. So I’m just trying to drive that home; to myself and everyone willing to listen. We can fly man, life just gets a bit too heavy sometimes, especially when you’re on earth, gravity doesn’t make flying very easy. It’s easy for an angel to fly from way up there. It’s much harder for us, but we do it regardless, that why I say that humans are actually more magical. The idea of angels is not a very literal one for me but it represents a very interesting dynamic and paradigm we have as humans. That God is up there and that the angels are up there, when all it’s all just inside. 2. If your poem had the power to change just one thing, what would it be? I’d be happy if it changed how we saw ourselves and others. We’re super awesome, all of us. We are way more powerful and divine than we think. 3. Which poem would you like to win…besides your own of course? I think “Mother” by Mandi Vundla is an obvious wonder. And the way it came to speak to her reality is very touching. May her mother rest in peace. 4. How do you feel about it being nominated in the Perfect Poem Category? I feel extremely honored. I do think it’s a well written and constructed poem, perhaps one of the most well put together in relation to my other works, which to me is reflective of my growth as a writer, so this nomination really acknowledges and confirms that for me. I’m very grateful and joyful, it was very fun to write, I really enjoyed the process, it was very adventurous and whenever I thought I was done it would just kept wanting to continue which is beautiful because the last parts are the ones that really speak to what the entire poem is about. 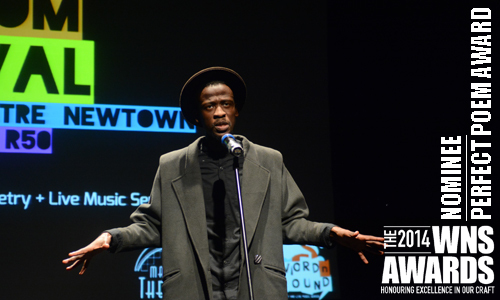 Poetry lovers have come to expect nothing short of extraordinary when Modise Sekgothe steps to the stage. 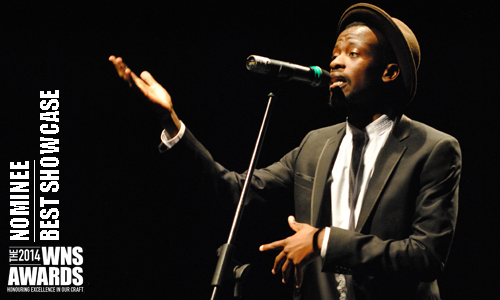 His showcase at the inaugural annual Spoken Freedom Festival at the Market Theatre did not disappoint. There was definitely something special for me, through and through. At times you perform and you’re giving it your all but it doesn’t always amount to that. Sometimes the microphone isn’t positioned properly and that fucks with some of my focus, there are very little things, sometimes the sound is too low or too high and that affects me. Such distractions take away from how deeply I can be immersed in the energy of the poem, this means forgetting myself and forgetting everyone there with me, it means forgetting that this is a performance and embodying and morphing into the poem itself, at that time only the poem exists, not Modise, not the audience, not the microphone, not the instrumental or the bad speakers, just the energy, enveloping every part of me from the inside out, out of every one of my pores into every one of your pores as the audience. It’s when I strip completely and I let every part of me to light and it’s clear to the observer and they enter and we journey, we forget and by the time we remember, we’re no longer the same, perhaps just a little bit, but we’re transformed forever by the experience. This was my experience, I can’t attest to what the audience felt of course but…it’s come to me that at that point, there is no audience, there’s just the poem, and we all feel it in the same way when it’s allowed to live completely. Which poet have you really enjoyed hearing/reading/watching this year? Who should we be looking out for? Zewande Bhengu. He’s a monster! His skill as a performer is generations away from where I am, I wanna get there. I am very inspired by what he does when he’s on stage. Koleka Putuma. I think she’s amazing. Yes, I am working on a project called “Metropolar” with Jotam Schoeman, who’s an insanely amazing Pretorian-based sketch-artist, visual artist and musician. “Metropolar” is a musical, spoken word, audiovisual production based on the Johannesburg CBD, all its horrors and beauties as observed and experienced by him and myself. It was born from an exhibition that he had at the Rubix Cube gallery in Maboneng, also portraying the harsh and interesting reality of life in the CBD. It’s a cool exploration of animation, video, sketch art, music and spoken word, I flex my singing skills in it…hehehe, he created a stop-motion video from his sketches creating an animated stop-motion representation of the poetry and music and theme. We’ve performed at the Rubix-cube gallery as part of Writers on Main, twice at the Atterbury Film Festival in Pretoria and will be producing a DVD to sell to the buying masses early next year. It’s going to be great!